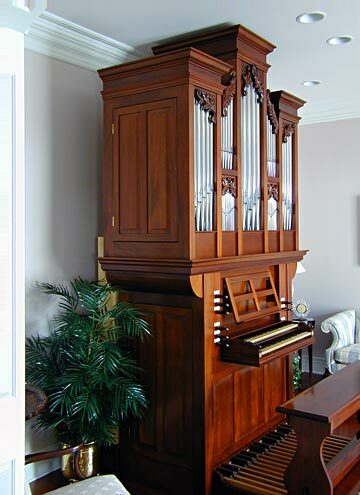 This small organ is located in a private residence on a bluff overlooking Collegedale, Tennessee. Collegedale is home to Southern Adventist University and Little Debbie snack cakes, and is only a few miles from our shop in Ooltewah. The contract was signed in 1996 and the organ installed in the spring of 1998. This, our first residential organ, was designed to be foremost a practice instrument in casework suitable for a home with classic architectural features. The facade pipes of the Principal 8 are continued through a full length wooden bass octave. The French polished mahogany case with Turkish boxwood keys contains all pipes and windsystem, except the bass octave of the Subbaß 16 foot on the back of the case, and the blower which is in a box to the side.